tjon901's review"Exotic 10 string Bich"
The B.C. Rich Bich is a classic design by them. The guitar is a staple in hard rock and not metal. A lot of Bich's made over the years have been 10 strings with the bottom 4 strings doubled like on a 12 string. With this setup you can get the chimey 12 string sounds on the high strings but still rock out on the low strings. This Bich has a quilted koa top although some come with spalted maple tops. I like the spalted tops better because you do not see them as often. The guitar has a fully bound neck and headstock bound with creme binding. The neck is a D shape that isnt too thick and it is a 5 piece maple neck with 2 strips of walnut dividing 3 pieces of maple. This makes the neck very strong stronger than a 1 piece mahogany neck would be. It has two rockfield mafia pickups which is the brand B.C. Rich uses. It has a custom B.C. Rich 10 string bridge. There are 4 extra tuners down by the bridge. It has two volume knobs and a tone knob with the bridge volume knob being the knob next to the bridge pickup. The body is made of two koa wings attached to the side of the 5 piece neck. Even with 10 strings the neck is not any more wider than a normal 6 string. The biggest difference is that you will have to remeber to tune the 4 extra strings. With the body shape and neck through construction it is very easy to reach the top frets. The ebony fretboard is super smooth under your fingers and easy to play on. The jumbo frets make bending very easy. It is easy to get a low action out of this guitar. The body is wide. At the widest point it is as big as a Gibson 355. Because the guitar is Koa it is not very heavy even though the body is big. It will take some getting use to playing leads with the double strings. The pickups are high output and intended for heavy music. They clean up ok. The clean tones could be better because when played clean the guitar does sound kinda bright and thin. 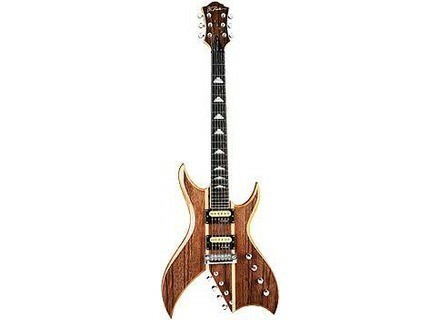 This guitar can do anything that comes with some gain from classic rock to heavy metal. You can get a lot of cool atmospheric sounds with the doubled high strings. This guitar may have a metal shape but it is really good at getting unique clean tones. The extra strings give it a built in chorus effect. This is one of the very few 10 string guitars on the market. It gets most of the cool sounds of a 12 string but with more playability and rockoutability. This guitar has great features for the price. There are not many neck through ebony fretboard guitars in the same price range. B.C. Rich is showing people that the more popular guitar companies are holding back on people. If they can make an guitar with a neck through neck and ebony fretboard why cant Fender or Gibson. If you are looking for a 10 string guitar with a shape that will get peoples attention this may be the right choice for you. To be honest this is your only choice really.